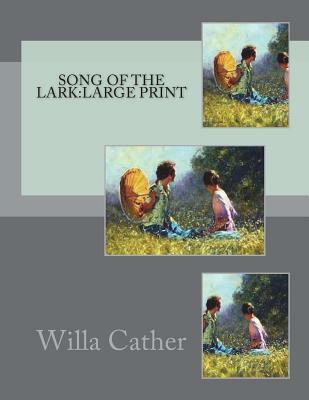 Song of the Lark by Willa Cather Set in the 1890s in Moonstone, a fictional town located in Colorado, The Song of the Lark is the self-portrait of an artist in the making. The story revolves around an ambitious young heroine, Thea Kronborg, who leaves her hometown to go to the big city to fulfill her dream of becoming a well-trained pianist, a better piano teacher. When her piano instructor hears her voice, he realizes that this is her true artistic gift. He encourages her to pursue her vocal training instead of piano saying ... "your voice is worth all that you can put into it. I have not come to this decision rashly." The novel captures Thea's independent-mindedness, her strong work ethic, and her ascent to her highest achievement. At each step along the way, her realization of the mediocrity of her peers propels her to greater levels of accomplishment, but in the course of her ascent she must discard those relationships which no longer serve her. (source: Wikipedia) We are delighted to publish this classic book as part of our extensive Classic Library collection. Many of the books in our collection have been out of print for decades, and therefore have not been accessible to the general public. The aim of our publishing program is to facilitate rapid access to this vast reservoir of literature, and our view is that this is a significant literary work, which deserves to be brought back into print after many decades. The contents of the vast majority of titles in the Classic Library have been scanned from the original works. To ensure a high quality product, each title has been meticulously hand curated by our staff. Our philosophy has been guided by a desire to provide the reader with a book that is as close as possible to ownership of the original work. We hope that you will enjoy this wonderful classic work, and that for you it becomes an enriching experience.